Statue of Liberty at night. THE LIGHTING SYSTEM. Rain fell on the night of the dedication, causing postponement of the brilliant fireworks, and also dimming Liberty's light. When the rain ceased, it was apparent that Freedom's lamp would not shine out the expected 50 miles to sea; and the lighting problem was long a perplexing one. The original electrical system has several times been replaced by more modern equipment. In 1916, from the Presidential yacht Mayflower, anchored close to Bedloe's Island, President Woodrow Wilson placed in operation the first adequate lighting system by pressing a wireless key that transmitted an electrical impulse to turn on new floodlights. Two hundred and forty-six projectors, utilizing 250-watt incandescent lamps, were located in the star points of the base of the monument and on roofs of small buildings on the island. Fifteen 500-candle-power gas-filled electric lamps were installed in the torch. A still more modern system was installed in 1931, including electric transformers, switch panels, automatic clock controls, and a complete new floodlighting system. This installation consisted of ninety-six 1,000-watt incandescent lamps enclosed in cast bronze floodlight projectors. Groups of 8 units each were placed in 10 points of the 11-pointed star masonry base. On the eleventh point was installed a battery of 16 flood lights to heighten the nighttime character of the face of the statue. A cluster of thirteen 1,000-watt incandescent lamps and one 250-watt incandescent lamp went into the torch. This improved system approximately doubled the lighting of the previous installation. 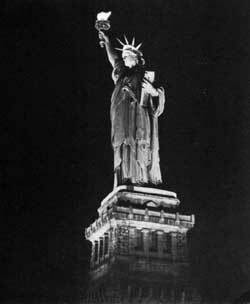 In 1945, to intensify the previous lighting, reveal the third dimensional effect of the statue, eliminate undesirable shadows, and, in general, "paint" the statue with light, 16 high-intensity 400-watt mercury-vapor lamps were added to the floodlight emplacements. Experiments with the torch revealed that mercury vapor lamps added brightness and a bluish-white color to the flame. The present floodlighting system consists of ninety-six 1,000-watt incandescent lamps and sixteen 400-watt mercury vapor lamps. THE TORCH REDESIGNED. In conjunction with the lighting improvement project of 1916, the torch, which was originally copper, was redesigned by using a total of 600 separate pieces of various tinted yellow cathedral glass to enhance and beautify the lighting effects. This work was executed by Gutzon Borglum, well known for his colossal sculptures of the likenesses of Presidents Washington, Jefferson, Lincoln, and Theodore Roosevelt on the granite face of the mountain at Mount Rushmore National Memorial. The torch is now lighted by ten 1,000-watt incandescent lamps, three 200-watt incandescent lamps, and six 400-watt mercury vapor lamps. The entire lighting is equivalent to 2,500 times the effect of full moonlight. THE ELEVATOR. Although provision was made for an elevator when the pedestal was constructed, the first one was not installed until 1908-9. The existing modern elevator was installed in 1931. STRUCTURAL IMPROVEMENTS. In 1937, it was discovered that certain platforms and stairways in the pedestal of the statue would have to be replaced. At that time also engineers made a thorough inspection of the framework and copper on the statue from the torch to the beams on which the structure rests. The spikes were removed from the crown of the head and rebuilt with new iron frames. Supporting ironwork was replaced where sections of it had rusted, and rivets which had loosened were removed and replaced by new ones. No change was made in the spiral stairway in the statue. Another recent improvement to the monument was the completion, in the fall of 1949, of the installation of a heating system in the base of the statue. Prior to this improvement, during the winter months, the huge mass of stone, concrete, and earth (estimated at 48,000 tons) became progressively chilled and was at its coldest during March when the air outside became warmer. The moist air coming off the water became condensed and saturated the walls. Condensation of moisture inside the pedestal, which had caused deterioration of the structure and its fixtures, has been eliminated by the new heating system, which also adds to the comfort of visitors and employees. Time has also improved the physical appearance of the statue. The former shiny copper exterior has been coated with an attractive patina of light-green verdigris which not only protects the metal from the effect of wind and rain but also enhances the beauty and dignity of the statue.